With spring well under way and gardens beginning to bloom, our minds turn to RHS Chelsea Flower Show. This unique and breath-taking event celebrates the very best of the horticultural world, unearthing new talents, and inspiring new trends. We will be returning to our usual spot, stand 334 on Main Avenue with a wonderful display of two greenhouses. But what's new I hear you ask? This year sees the launch of The Alitex Paint Collection by M&L Paints. A palette of 15 colours that match, contrast and complement our most popular greenhouse shades. Available in Exterior and Interior Eggshell, Masonry, Full Gloss and Chalky Interior Matt, our premium quality paints are made exclusively for us by M&L Paints. You can now transform your trellis, upgrade your garage and add a flourish to your garden furniture in perfect harmony with your greenhouse. We have collaborated with acclaimed Author and Interior and Garden Stylist, Selina Lake. Selina's passion for the horticultural world is certainly demonstrated in her love of all things botanical. Her careful curation of colours and floral displays will inspire your own outdoor spaces. She will be weaving the wonderful new colours of The Alitex Paint Collection throughout the stand. 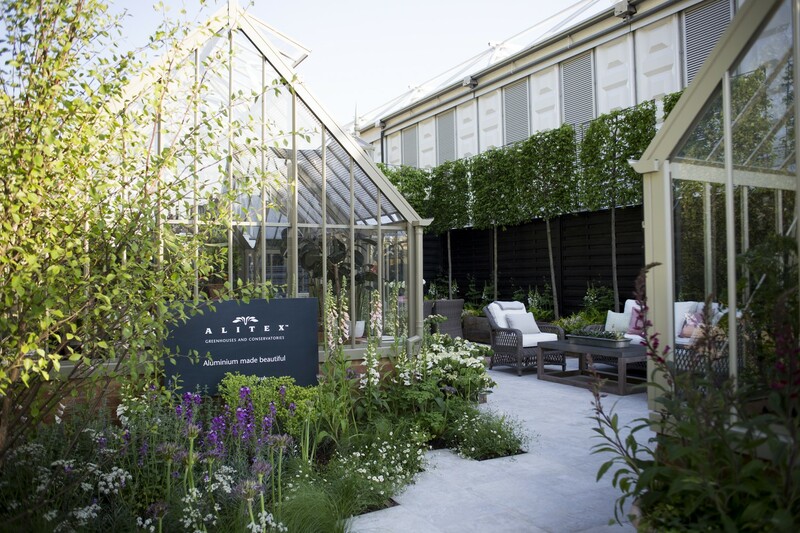 Although not a newcomer to the Chelsea scene, Garden Designer Jake Curley will be returning to create another beautiful and inspirational garden setting for our Alitex greenhouses. Jake joined us last year after becoming a finalist at RHS Tatton Young Designer of the Year. His attention to detail and outstanding creativity will see our greenhouse structures set in a traditional country garden with plenty of colour from herbaceous planting, complementing the Alitex Paint Collection by M&L Paint. We will be exhibiting two greenhouses this year. A Scotney from our National Trust Collection in Wood Sage, demonstrating a functional, low-maintenance design for keen gardeners with limited space. This will be complemented by a larger bespoke lean-to structure in Sussex Emerald. The bespoke greenhouse features a partition wall that allows you to create two distinct environments in one structure, a really versatile use of space to accommodate diverse growing requirements. Whether you want a practical area or an entertainment space for guests, Alitex can design you the perfect environment for your needs. If you're at RHS Chelsea Flower Show this year soak up the atmosphere with a glass of bubbles on our stand (334).